We can stripe, letter, flame, or wrap it. We also create & install Custom Cutout Vinyl Letters and Designs for your boat or marine vehicle. We can transform your boat with wraps that reflect your style and provide a personalized message every time you set sail. We install wraps for boats of all sizes. We can stripe it, letter it, flame it, or wrap it. We can also create and install Custom Cutout Vinyl Letters and Designs. Don’t just drive it, jazz it up and make it your own with bright, colorful boat wraps and boat decals. With today’s technology, boat wraps can even cover most of your windows without limiting visibility. Full color digital marine wraps make a lasting impression as you cruise. Reflective boat decals and lettering give you instant visibility around-the-clock. Make a strong statement on glass while maintaining visibility within with perforated window film. Turn your company vessels into rolling billboards with marine wraps, boat wraps, and boat decals. Full boat wraps ensure your message appears on every side of your vessel for maximum visibility. Expand your advertising without increasing your budget! Boat Wraps will turn your vessel into a colorful and eye-catching cruising billboard that draws thousands of impressions per day. 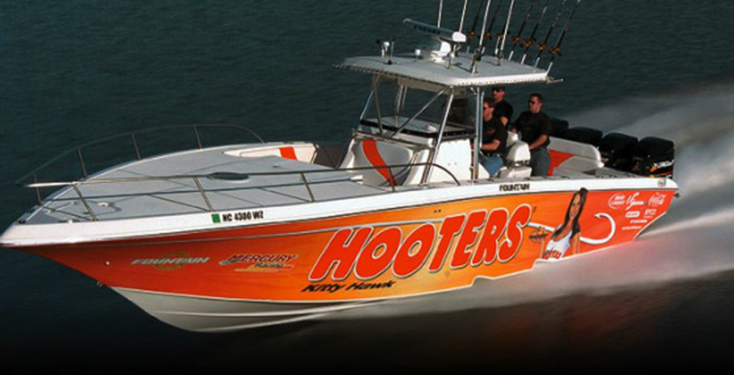 Boat wraps are the most cost-effective form of advertising that money can buy. With boat wraps, boat decals, and marine wraps, your boat will be working for you day and night. Achieve durable, affordable, high-resolution print quality results on vinyl and one-way view perforated laminate. We offer technically advanced large format graphic boat wraps to offer you an affordable, high-resolution alternative to custom paint. We can help you design your own custom marine wrap with custom pre-built layers, or you can choose from our gallery of boat wrap designs. We invest in the latest digital imaging and printing equipment to provide stunning color and resolution for your boat wrap. Whether you pick a boat wrap design from our gallery, or create your own unique look, our service advisers are experienced industry professionals that can answer your questions and help you complete your order. We work around your schedule to complete marine wrap installations in a manner that is least disruptive to your business. We have the capacity to complete boat wrap installations during the day, night, or on weekends. We survey every customer at the completion of all marine wraps to ensure the quality meets, or exceeds, their expectations. No invoice is issued until the customer is fully satisfied with our marine wrap, boat wrap, or boat decal. Our expert professionals can help you choose from our many marine wraps and boat decals, and our project coordinators will assist you throughout the entire process. Call us to schedule an appointment for a FREE, no obligation boat wrap consultation and estimate.